A historical overview of the railroad-marine interface - the terminal where railroad tracks meet lakes or sea, from a modeler's perspective. Chapters on break bulk piers and terminals, grain terminals, mineral terminals, railroad ferries and car float terminals, container terminals, barge terminals, ship building, and modeling water and wharves. Prototype information along with buildable track plans and modeling tips. • A variety of scales, including HO, HOn3, N, S, Sn3, O and On30. • A variety of portrayed locations, including Great Britain, Peru, France, Iran, all over the United States, and a futuristic plan set on Mars 70 years from now. • Room-sized plans to those that fill a basement or garage. The plans are present innovative concepts and some ideas never before seen on model railroads. Here are two reviewer's comments. Tom E writes, "I have just received a copy of Mr. Bernard Kempinski's new Model Railroad book "45 Original Track Plans" having been in the Model Railroad hobby for over 42 years and having read an infinite amount of track plan books I can truly say this one is the best one ever! Having been a "rubber gauger" with many layouts built HO, HOn3 ON3. ON30, O SG, 1.20.3, 7/8n2 I find this to be the definitive work encompassing all scales. Over the years I have visited many of the Railroads and locales proposed in the book and find that Mr. Kempinski has captured the essence of all of them. The plans are simple & straight forward all scales and sizes all of them ooze authenticity and great operating possibility, this is the book you need on your reference library book shelf!!" Bruce M writes, "A copy of your book arrived here this week. Very nice! I have not read the entire book but have flipped through all the pages and read 5 or 6 descriptions. I share your love at looking at track plans. As a Westerner, I can see your Eastern afinity but you have plenty of Western roads - especially in the larger layouts. I guess we need more wide-open spaces. I also enjoy switching layouts so the small ones have lots of interest to me. I especially appreciate the prototype background you give on the railroads and the operational suggestions. Clearly you have thought about opearations when you draw up the plans." The book features amazing photos from over a dozen layouts, including three new fantastic layouts that have not been published in the model railroad press, and three new projects layouts built specifically for the book. View of sample of the book click here and see sample video below. We will ship these books starting the week of December 8, 2014. Order now to reserve a signed copy. Matt L. says, "My signed copy arrived in California only a few days after ordering. Impressive. I have already read the book through once and am looking forward to a more detailed read. With roots in the Army of the Potomac and the Marine Brigade of the AEF (loved the photo of the Marines on the 40 and 8!) I naturally found the Civil War and Cambrai chapters particularly interesting. How people engineer and operate sophisticated (for the time) transportation systems under such extreme circumstances is fasinating, but I think it is important not to loose sight of the awful tragedy those circumstances reflect, and I thought the book found that balance well. Very nice work. 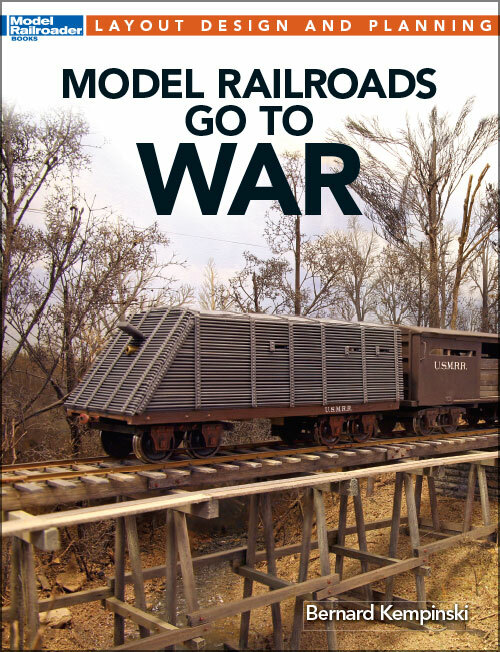 Richard B says, "I finished reading your "Model Railroads Go To War" last night and want to let you know that I found it well crafted and very informative. I've been hanging around this hobby for decades, but almost everything you presented was new to me. Thanks for your effort." This is a short video featuring one of the project layouts built especially for the book. This book provides a reference for modelers to the workings of steel mills and the railroads that serve them. From raw-materials-in to steel-products-out, The Model Railroader’s Guide to Modeling Steel Mills explains the industrial process and the massive complex built around steel production. The model railroader using this book will better understand how to create a realistic mill area and set up its rail operations. Chapters are included for steelmaking, steel mill railroads, steel mill track planning, and modeling tips. Kalmbach Publishing has an 8 page preview on their website at http://lib.store.yahoo.net/lib/yhst-22106725251441/12435spread.pdf. Features 26 innovative model railroad track plans in Z, N, HO, O, and G Scales that fit spaces from 8'x10' to a 20'x20' G Scale garage layout. Based on such interesting prototype lines as Western Maryland – Thomas Subdivision, White Pass & Yukon, Norfolk Southern's Shirley Industrial Park, Chesapeake & Ohio's Chicago Divison, Denver & Rio Grande Western's Craig Branch, Erie/LTV Mining Railroad, Utah Railway, USMRR City Point Line, Wiscasset, Waterville and Farmington and New York City's Bush Terminal. Each chapter presents a different prototype, provides a historical background, with operational information and includes track plans in multilple scales. The text is accompanied by numerous photos, maps and diagrams. Click here to download the Table of Contents and a sample of the text.